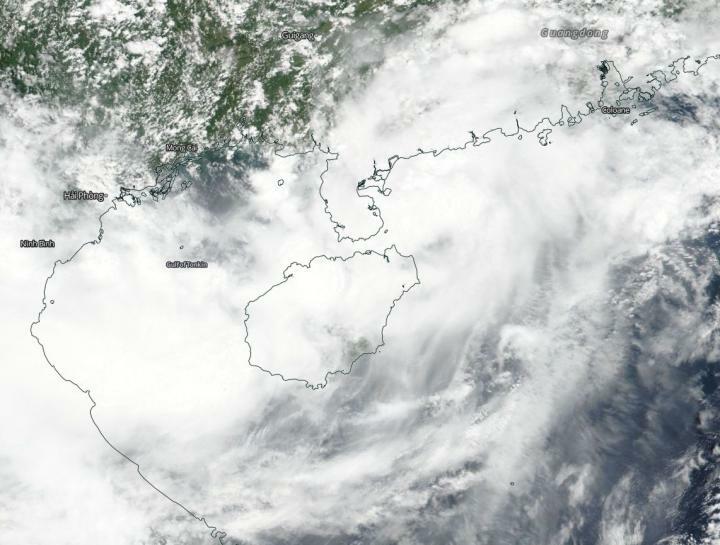 Tropical Storm Bebinca continues to rain on Hainan Island, China and has been doing so for days. On Aug. 15, when NASA-NOAA's Suomi NPP satellite flew overhead it captured a visible image of the storm. The Visible Infrared Imaging Radiometer Suite (VIIRS) instrument aboard NASA-NOAA's Suomi NPP satellite captured a visible image of Bebinca that showed a center surrounded by powerful thunderstorms. The northern quadrant of Bebinca extended into the mainland of southern China and the western quadrant extended over Hainan Island in the South China Sea. On Aug. 15 at 5 a.m. EDT (0900 UTC), the Joint Typhoon Warning Center reported the center of Tropical Storm Bebinca was located near latitude 20.9 degrees north and longitude 111.2 degrees west. That's about 170 nautical miles southwest of Hong Kong, China. The tropical storm is moving toward the west-northwest. Maximum sustained winds were near 40 mph (35 knots/62 kph). Bebinca is expected to move west through the Gulf of Tonkin and make landfall in Vietnam, tracking south of Hanoi.